An ankle sprain is a type of ankle injury that can be taken care of the right way, or become an ongoing event when overlooked. It depends on the level of attention you give to it. You want the former to be your situation as an unstable ankle can cause consistent injuries to your ankle. 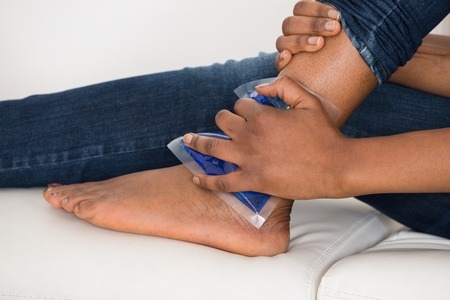 More importantly, an ankle sprain is damage to the ligaments that connect the leg and foot bones. Your ankle twists in a strange direction and those ligaments mentioned earlier are pulled beyond what they can withstand. This usually occurs during sporting activities or sudden movements. Symptoms of this type of injury are swelling, sensitivity to the touch, a wide range of pain depending on how severe the sprain is and the inability to bear weight. If you do not treat this as a serious injury, it could keep happening repeatedly and eventually cause secondary injuries to other areas of your foot like the tendons or blood vessels. Use ice packs and compression to reduce any swelling or to prevent it from getting worse. Lower the amount of weight you put on it and be careful not to make any sudden movements. Utilizing physical therapy to gain back strength and stability to the sprained ankle will also prove beneficial in preventing another ankle sprain. Take anti-inflammatories for significant swelling. Surgical procedures such as arthroscopic surgery may be required if your ankle sprains consecutively and causes serious damage and can help to mend injured ligaments. Here at Performance Foot & Ankle Specialists, LLC, our podiatrists, Joel S. Segalman, DPM and Dr. Stephen Lazaroff, DPM, understand the complications of ankle sprains and the pain that it can bring when not handled in the right way. Please contact us to make an appointment as we have two offices conveniently located in Waterbury & Newtown, CT. Our office strives to provide targeted treatment and, we are confident that we can help you get over your ankle sprain quicker than you think!